Arroz Negra, Black Paella. I have several requests for this dish several months back. This is my first attempt to cook black paella. I have cooked paella on countless occasions, it is a regular dish on our Noche Buena every Christmas I even cooked the rice cooker version. Now I have to try this black version. I browse the nett to find out what is the ingredient that make the black color of this dish. Some recipe suggested using the black variety rice. I did try to look for this type of rice but instead I could only find a violet colored variety. But most recipe use the ink of squid and again those recipes are suggesting that the ink they collected from the squid are not enough to make the dish really black otherwise use a bottled squid ink available only at some deli shops. Or if you are desperate use food coloring. Squid is one of my favourite seafood, I am sure the amount of black ink from the three big pieces of grilling size squid is more than enough to give a jet black color to the dish. Just make sure that the ink sack you have collected from each squid is still full which is about one teaspoon of concentrated nearly solid ink from each squid. Otherwise you need more squid. In a big pot fry chorizo until it start to sizzle, set aside. Sauté garlic and onion, add in tomato and roasted bell pepper stir cook for 2 to 3 minutes. 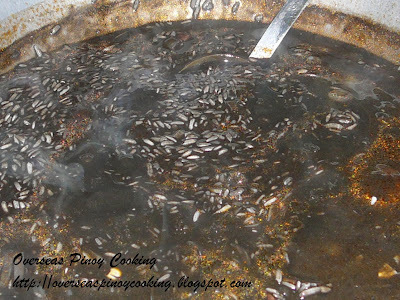 Add 1/2 cup of water, continue to stir cook until most of the liquid has evaporated and turn into an oily thick sauce. 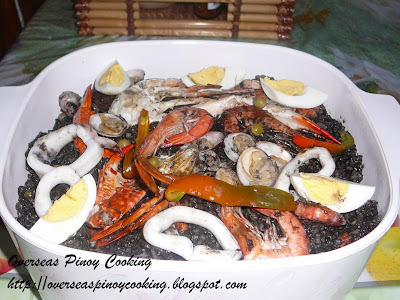 Add in chorizo, squid ink, fragrant rice and malagkit stir until rice is coated and infused with the sauce and tinted with the black ink. Add 4 to 6 cups of water and cook rice stirring occasionally add more water as necessary. When done stir in green peas and arrange seafood on top. Cover and leaving the rice to finish cooking in the steam for 20 to 30 minutes. Transfer black paella in a platter, arrange seafood on top, drizzle with kalamansi juice and garnish with wedges of hard boiled eggs.